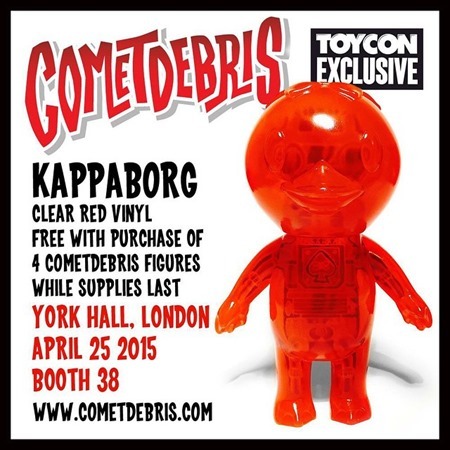 Cometdebris for ToyConUK 2015 Round 4! 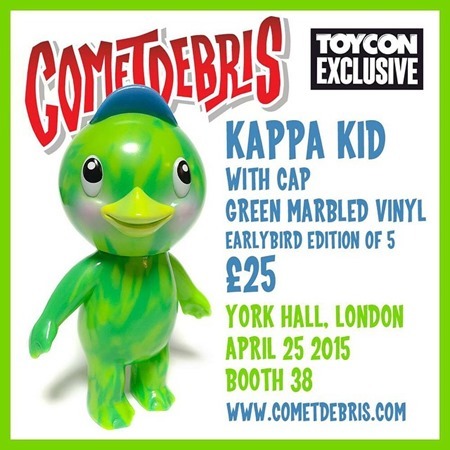 Cometdebris is really pumping out some sofubi goodness for this years ToyConUK. To follow up with our previous posts of his releases (HERE, HERE & HERE), he has 3 more to add to the list! Check out the Second release of his Clear Red Kappaborg, which is only available if you purchase 4 Cometdebris figures. That sounds easy enough since he has so much to offer! These will be available while supplies last. 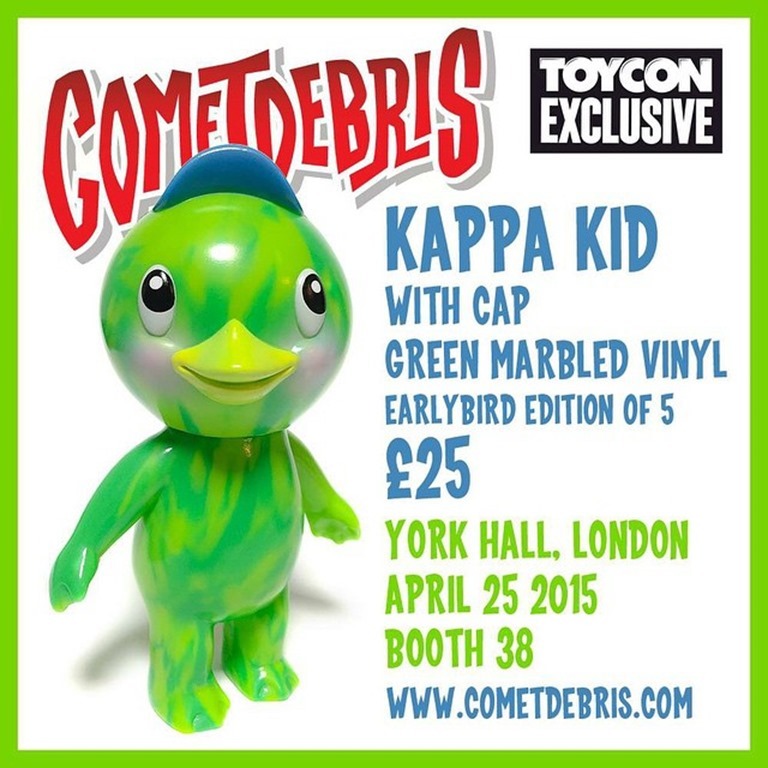 We’ve also got the new Kappa Kid with Cap in green marbled vinyl. This is the earlybird edition, which is an edition of 5 for £25. You have to get there quick for this one! Last but defintely not least is another Gravy Toys x Cometdebris collaboration. Peep the clear blue and glow marbeled Jeff figure for £35 a piece. He would go great with Lonny! 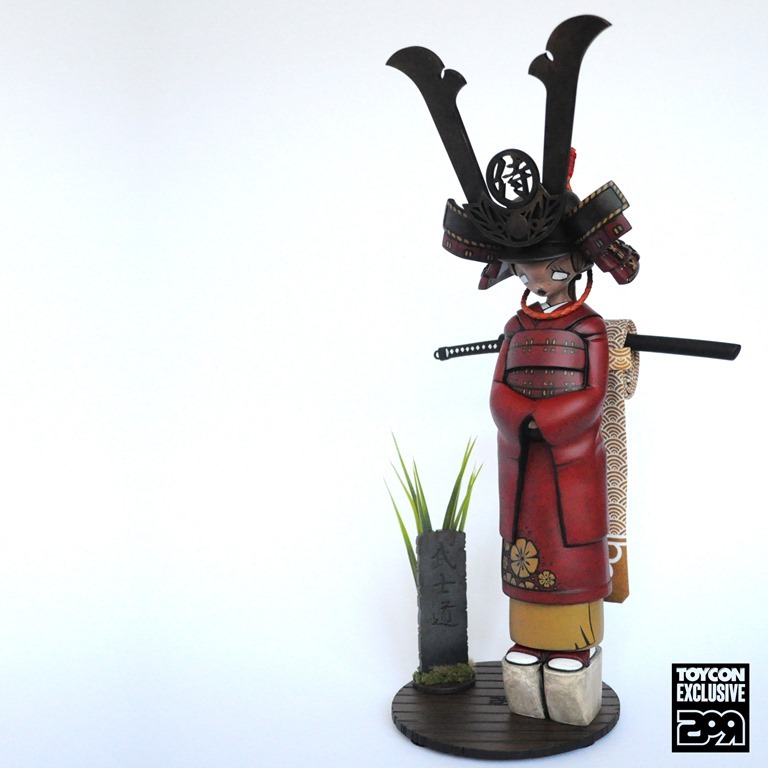 2PetalRose has put together 4 special variants of his Maiko figure for the OneSixthBruce booth at ToyConUK. Each figure stands approximately 15” tall and includes a stand and helmet. These one-of-a-kind customs are all amazing and we would have a hard time which one we would want! 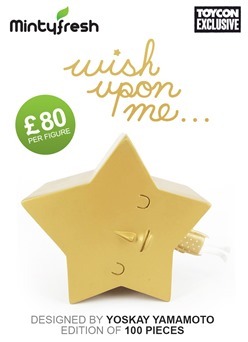 Each figure will retail £200 GBP each and are guaranteed to go quickly. Take a gander at the other 3 designs after the jump. Jeremiah Ketner will be bringing loads with him to ToyConUK! One of them being Happy Pups, a special custom edition of Martin Hsu’s Blacky figure. These will be limited to only 5 pieces and will also come with a matching original painting by Martin! You can find these and many other original pieces by Jeremiah’s at his booth during ToyConUK! 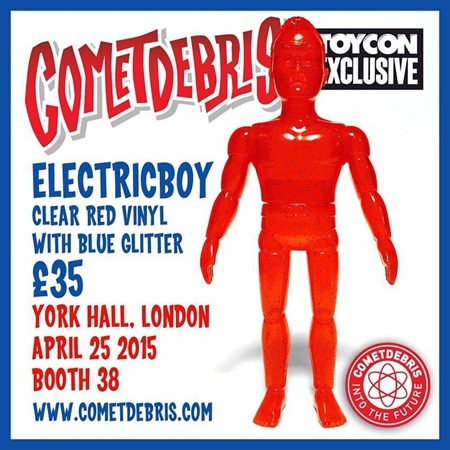 Cometdebris for ToyConUK 2015 Round 3! Cometdebris has even more to add to his ToyConUK exclusive arsenal! At his booth will be a new Electricboy, who is cast in a clear red vinyl with blue glitter for £35. 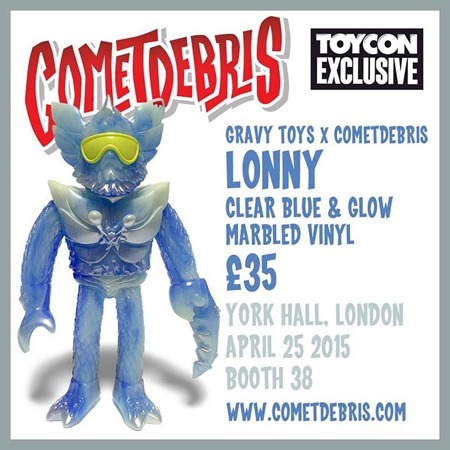 There is also the Gravy Toys x Cometdebris edition Lonny, who comes in a clear blue and glow marbled vinyl for £35. All of these sweet figures will be available at his booth #38. Check back on his other ToyConUK exclusives HERE and HERE. Gary Ham and Pobber asked Jon-Paul Kaiser to come up with his own take on Gary’s Sylvan figure. And thus, the fearsome King of Mischief was born. Drawn from JPK’s signature black and white aesthetic with more than a hint of bad intentions, King is the ultimate contrast to the colorful and upbeat Sylvan. Ying and Yang. 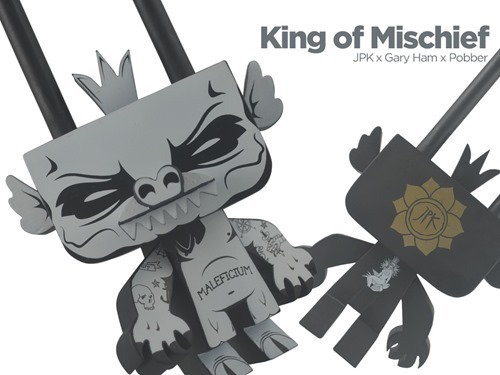 Limited to only 100 pieces, King of Mischief will first be released at ToyCon Uk by the Hang Gang and then be offered in a wider-reaching release (presumably online). Cometdebris will once again be venturing out to the United Kingdon for this years ToyConUK. Tucked safely in his luggage will be some amazing exclusive releases you’re going to want to check out. 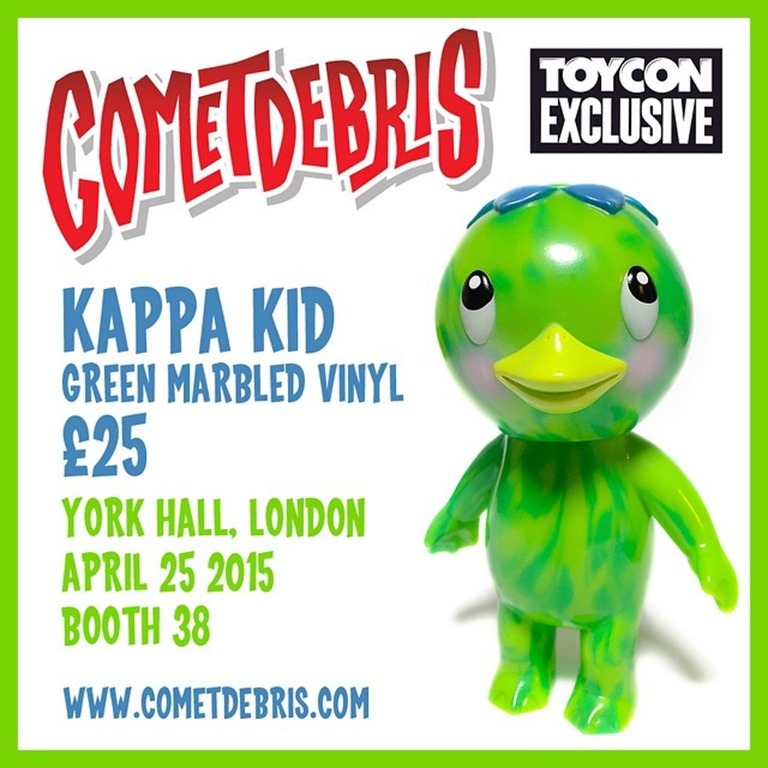 The first of his releases will be his new Green Marbled Kappa Kid for £25. There will also be the all new Kappa Shonen in a Glow vinyl with purple shirt and green pants for £40. We are also expecting to see more coming from Cometdebris, so stay tuned! If you are lucky enough to check out ToyConUK, be sure to stop by his booth #38. Mintyfresh has announced two of their exclusives for ToyCon UK (4.25)and expects to announce one more shortly. So far we know that they will be releasing a gold edition of Wish Upon Me by Yoskay Yamamoto and Mighty Jaxx (100 pieces, ~ $120) as well as the Spirit Ager Neo Japan (~120) by Junnosuke Abe x Restore. The fearsome Sprit Ager features clear vinyl with pink, gold and black spray. If you’re going to the ‘con, be sure to check out Mintyfresh’s booth.